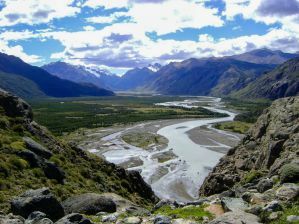 El Chalten is in the Patagonian region of Southern Argentina. It is a small town that is popular with tourists as the gateway to Mt. Fitz Roy and Cerro Torres. These are two of the most famous and impressive peaks in the Patagonian Andes. The town has grown to accommodate the increasing popularity of the area and during the summer months it is full of tourists. There are a handful of hotels and hostels around town, but they fill up quickly during the peak season, so reservations are a must. How much do hostels in Argentina cost? Lo De Trivi is a favorite hostel in El Chalten. The staff work hard to maintain a personal atmosphere with a friendly and welcoming vibe. The hostel is conveniently located very close to the beginning of the trails, so if you're planning to do a lot of hiking or mountain activities, you'll really appreciate the location. The hostel has a variety of different room options. There are traditional style dorms that have bunk beds and lockers. These dorms sleep either four or six people and are the most basic and simple rooms. They are great for travelers who are on a particularly tight budget. If you have a slightly higher budget and want a little more privacy, there are cabins. These cabins include a double bed and they use shared bathrooms. The cabins are small and basic, but they are also private and still affordable. There are also private double rooms with attached bathrooms. These are the most expensive option available. The hostel also has all of the standard amenities and activities that you would expect from a hostel. There's a book exchange, shared kitchen, breakfast (for an additional fee), board games, luggage storage, satellite television, laundry facilities, and beverages which you can purchase. Rancho Grande Hostel is another favorite hostel in El Chalten. It's also located near the hiking trails and it is a convenient place to base yourself while you're in the area. This hostel is located on the main avenue in Chalten and is close to Zafarrancho Music Bar, which is open nightly and hosts several parties a week. This is a social and fun place to stay and you're sure to meet other travelers from around the world while you're here. The hostel has some wonderful amenities available for guests including kitchen facilities, luggage storage, internet access, laundry facilities, and an on-site restaurant. This is the perfect place to relax with other travelers after a tiring day out on the trails. The staff are also great. They're bi-lingual and they work hard to make sure your stay is comfortable. They can give you any information you might need about things to do and see in the area, upcoming weather, and fun activities. You can also book any number of excursions through the hostel, or accommodation for future cities you plan to visit. Bus tickets are available through the hostel as well and they can even help you arrange flights. This hostel is a popular option and it fills up quickly, so it's best to make reservations well in advance. There are twin, double, and four bed private rooms. Hospedaje Mi Rincon is less of a hostel and more of a bed and breakfast, but it's a good option for budget travelers who want a peaceful and comfortable place to stay in El Chalten. It's a really small place, with only two rooms. There's a twin room and a double room and the size of the hostel means you'll get a lot of personal attention, and the staff really focuses on the details. This is a peaceful and quiet place to stay that has a lot of character. The hosts are friendly and they can give all kinds of advice on the best hikes, restaurants, and more. Because the bed and breakfast is so small, they go out of their way to accommodate any special needs or special requests you might have. Breakfast is served every morning. It's a simple breakfast, but it serves its purpose. If you're looking for a bit of privacy and want a quiet retreat, then this is one of your best options in El Chalten.